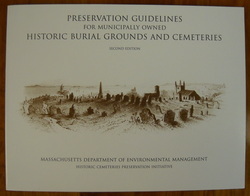 In 1999, the DCR launched the Massachusetts Historic Cemeteries Preservation Initiative. The twenty-nine participating communities received preservation planning assistance from a consultant team led by Walker-Kluesing Design Group. At the conclusion of the project, the DCR published "Preservation Guidelines for Municipally-Owned Historic Burial Grounds and Cemeteries". The second edition of Preservation Guidelines is now available. This book was published in 2002. According to her website - Your Guide to Cemetery Research illuminates the fascinating practice of cemetery research, from determining an ancestor’s final resting place to decoding mysterious headstone symbols. 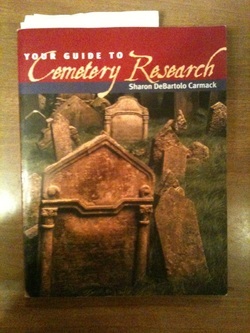 You’ll learn how cemeteries can help fill the holes in your family history research. You’ll gain a comprehensive overview of American burial customs, attitudes toward death, and funeral rites for a variety of ethnic and religious groups. Also included are dozens of helpful sidebars and appendixes that examine gravestone art, symbols, and emblems; plus a medical glossary of causes of death and a historical time line of deadly diseases and epidemics. It’s all you need to dig up the family history facts you’ve been looking for.